The oldest preserved furnished houses in the world. Skara Brae, The Orkney Islands, Scotland. Skara Brae is a stone-built Neolithic settlement, located on the Bay of Skaill on the west coast of Mainland, the largest island in the Orkney archipelago of Scotland. It consists of ten clustered houses and was occupied from roughly 3180 BCE–2500 BCE. Around 2500 BCE, after the climate changed, becoming much colder and wetter, the settlement may have been abandoned by its inhabitants. There are many theories as to why the people of Skara Brae left, particularly popular interpretations involve a major storm. Evan Hadingham combined evidence from found objects with the storm scenario to imagine a dramatic end to the settlement. 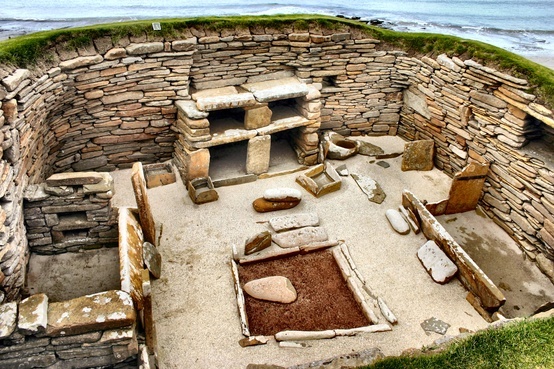 Europe’s most complete Neolithic village, Skara Brae gained UNESCO World Heritage Site status as one of four sites making up “The Heart of Neolithic Orkney.” Older than Stonehenge and the Great Pyramids, it has been called the “Scottish Pompeii” because of its excellent preservation. In the winter of 1850, a severe storm hit Scotland causing widespread damage and over 200 deaths. In the Bay of Skaill, the storm stripped the earth from a large irregular knoll, known as “Skerrabra”. When the storm cleared, local villagers found the outline of a village, consisting of a number of small houses without roofs. William Watt of Skaill, the local laird, began an amateur excavation of the site, but after uncovering four houses the work was abandoned in 1868. The site remained undisturbed until 1913 when during a single weekend the site was plundered by a party with shovels who took away an unknown quantity of artifacts. In 1924 another storm swept away part of one of the houses and it was determined the site should be made secure and more seriously investigated. The job was given to University of Edinburgh’s Professor Vere Gordon Childe who traveled to Skara Brae for the first time in mid-1927. Skara Brae’s inhabitants were apparently makers and users of grooved ware, a distinctive style of pottery that appeared in northern Scotland not long before the establishment of the village. The houses used earth sheltering but, being sunk into the ground, they were built into mounds of pre-existing domestic waste known as “middens”. 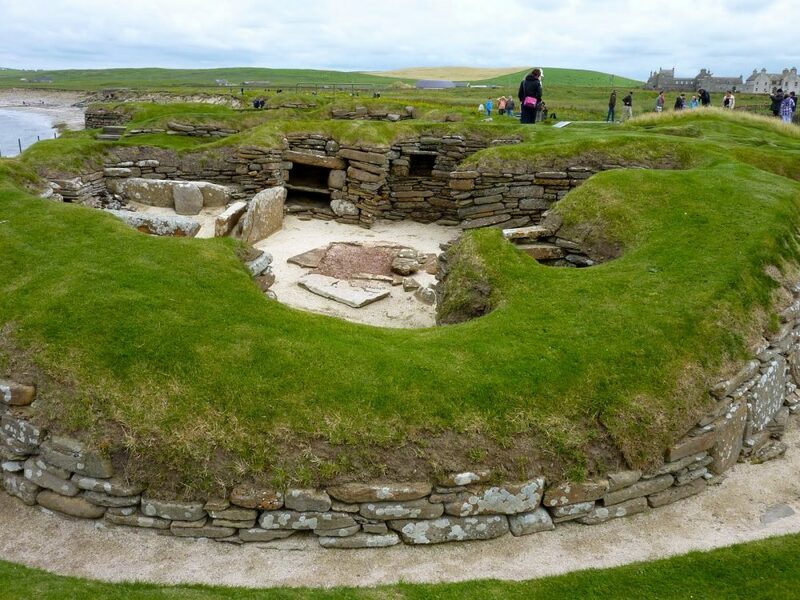 Although the midden provided the houses with a small degree of stability, its most important purpose was to act as a layer of insulation against Orkney’s harsh winter climate. On average, the houses measure 40 square meters (430 sq ft) in size with a large square room containing a hearth which would have been used for heating and cooking. 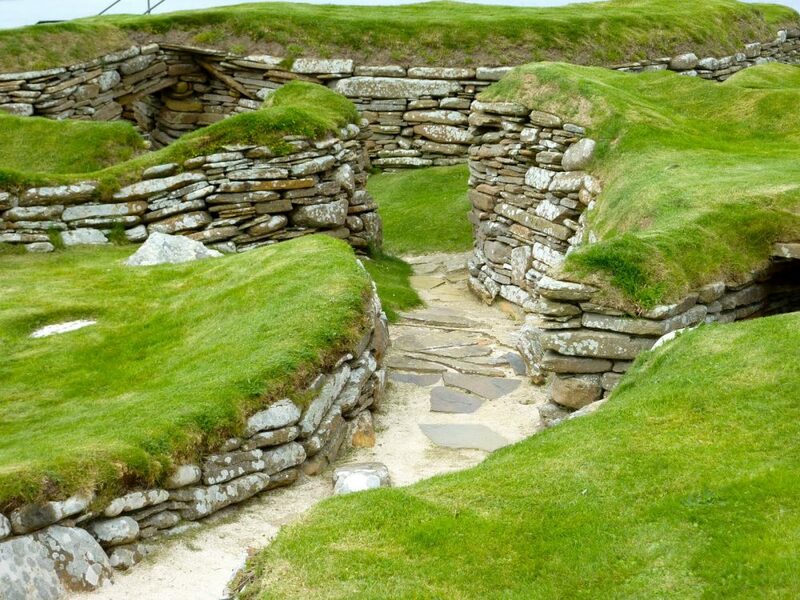 Given the number of homes, it seems likely that no more than fifty people lived in Skara Brae at any given time. The dwellings contain a number of stone-built pieces of furniture, including cupboards, dressers, seats, and storage boxes. Each dwelling was entered through a low doorway that had a stone slab door that could be closed “by a bar that slid in bar-holes cut in the stone door jambs”.A sophisticated drainage system was even incorporated into the village’s design, one that included a primitive form of toilet in each dwelling. Lloyd Laing noted that this pattern accorded with Hebridean custom up to the early 20th century suggesting that the husband’s bed was the larger and the wife’ s was the smaller. The discovery of beads and paint-pots in some of the smaller beds may support this interpretation. Additional support may come from the recognition that stone boxes lie to the left of most doorways, forcing the person entering the house to turn to the right-hand, ‘male’, side of the dwelling. At the front of each bed lie the stumps of stone pillars that may have supported a canopy of fur.